Huge sellers after the first five days of the quadrennial soccer shindig: Brazil, France, Germany (before the game against Mexico) and Ronaldo, the Portuguese star (first name: Cristiano) who rained goals on Spain’s plain right out the box. It was 1:10 p.m Monday — still pretty much World Cup stoppage time — when I ducked into the Soccer Zone at 1205 W. Warm Springs Road in Henderson and asked if anybody had done the same to purchase a Harry Kane England jersey. But John Habibian, the young man who was minding the store founded by his father, Fred, said a guy in fact had done exactly that, and that I missed him by about five minutes. England soccer fans are steadfast and spontaneous, Habibian said. But they aren’t quite as steadfast and spontaneous as local Mexican supporters who by Father’s Day had cleaned the racks of all green road kits, save for one XXXL and one small, and put a Chucky Lozano-sized dent in the white shirts as well after “El Tri” defeated defending champion Germany. Reinforcements are en route, Habibian said. Other huge sellers after the first five days of the quadrennial soccer shindig: Brazil, France, Germany (before the game against Mexico) and Ronaldo, the Portuguese star (first name: Cristiano) who rained goals on Spain’s plain right out the box. USA? Not so much. The Yanks lost to Trinidad and Tobago — hey, at least it took two countries playing as one to beat us — and did not qualify for this year’s World Cup. Habibian said Caesars Palace is the man of the match as far as he is concerned, because the hotel-casino giant is permitting employees to wear soccer jerseys to work during the World Cup. Otherwise, he’d probably still have his entire inventory of red, white and blue with the stars and stripes. Tucked like a well-placed corner kick between a State Farm Insurance office and a mattress place in a strip mall behind Sunset Station, the Soccer Zone has been serving the soccer needs of Las Vegas for 13 years. Fred Habibian is a former MGM Grand pit boss who immigrated to St. George, Utah, before the Iranian Revolution of 1978 when he was 15 with but a few dollars and a dream in his pocket. He opened the soccer shop after he operated a Days Inn in St. George and started a pest control business in Las Vegas. And here you thought Iceland salvaging a tie against Argentina when Lionel Messi missed a penalty kick was bucking the odds. 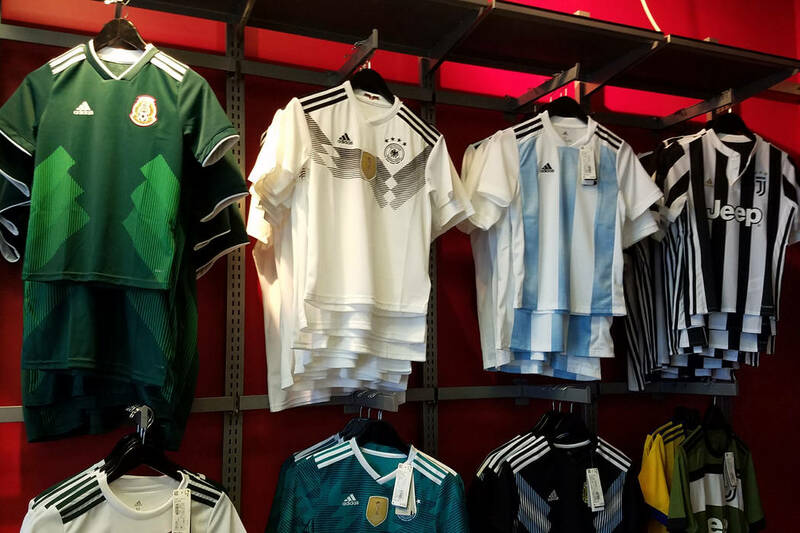 The Soccer Zone mostly carries jerseys of the popular World Cup sides, but can order those of smaller nations provided they are manufactured by equipment suppliers such as Nike, Adidas, Puma and Umbro. Youth jerseys cost $70; adult sizes sell for $90. Personalized shirts, with the name and number of one’s favorite player —or one’s dentist, if that’s your thing — are an additional $30. “Nigeria was a big one — that was one of the best selling jerseys I came to find out, “ John Habibian said. “I’m kind of upset Nike didn’t give me any of those. Or perhaps Sig Rogich might be able to help. The Las Vegas media mogul grew up in an archipelago off the south coast of Iceland, and the last time we chatted he was trying to teach the thunderclap to former U.S. presidents Bush (George H.W.) and Clinton, under whom he served as ambassador to Iceland. But, more importantly, how does one procure a can of Magic Spray? John Habibian said the Henderson store is all out of the freezing aerosol product that trainers (or physios, if one prefers) spray on World Cup players who feign injuries in an attempt to induce penalty kicks. But he said the Soccer Zone location at 7240 W. Lake Mead Blvd. has enough to last to the knockout stage and beyond. Good to know for the next time the U.S. Men’s National Team meets Trinidad and Tobago in an international friendly. Mexico’s World Cup victory over Germany on Sunday averaged a total audience delivery of 7.4 million viewers across Telemundo, TelemundoDeportes.com, and the Telemundo En Vivo and NBC Sports apps, and the TV-only viewership of 6.56 million topped any World Cup group stage match on Spanish-language TV. The match also ranks as the sixth most-watched World Cup match ever on Spanish-language TV. Telemundo’s Sunday coverage averaged 3.7 million television viewers ranking as the most-watched Sunday daytime in Telemundo history and more than tripling the prior record set during the 2017 Confederations Cup.